Welcome to the Misunderstood Eggplant! This is a collection of recipes, blog entries, and other fun stuff related to the the kitchen and the home. Look for updated content coming soon to 2014, including brand new recipes. Temperatures are starting to dip as we get closer to fall, which means it’s time for a cool weather stand-by: soup. This soup takes advantage of carrots found at the local Farmer’s Market, using orange, white, yellow, and even purple carrots. 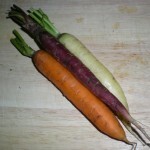 If you cannot find mixed carrots, use regular carrots and perhaps a parsnip for variety. Also, this recipe uses the carrot greens, but parsley is a perfectly adequate substitute. 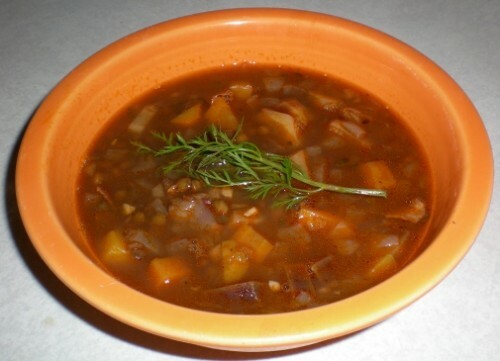 For this recipe, I used French lentils, which are black and smaller than standard lentils. Regular brown or green lentils are fine as well, just check cooking times to be sure the lentils are softened to a desired consistency. I also used an infused Tarragon Vinegar, but white wine or red wine vinegar can be used instead (or another infused vinegar of your choice, such as shallot vinegar). In a large Dutch oven, cook bacon over medium heat until browned and crisp, about 8-10 minutes. Add onions and carrots, cook until softened, about 5 minutes. Add garlic and saute 30 seconds. Add tomato paste and saute for 1 minute. Add lentils, thyme, bay leaf, cinnamon stick, chicken broth and 2 cups water. Bring to a boil, then reduce to a simmer. 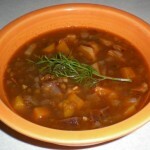 Cook, covered, until lentils are tender, 30 to 45 minutes. If soup becomes too thick, add up to 1 cup more water (or chicken broth). Remove thyme sprig, bay leaf, and cinnamon stick. Stir in vinegar, 1 tsp salt, and 1/4 tsp pepper. Top with carrot greens and serve immediately. Mama never made pork and beans like this! Use any combination of summer vegetables you like. 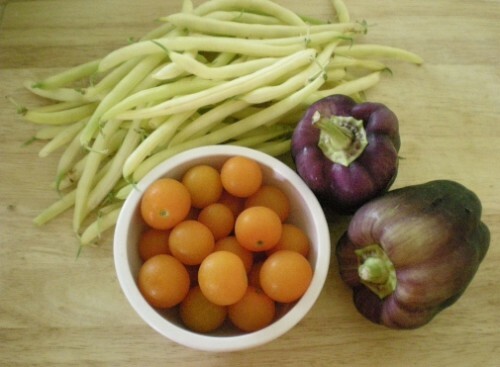 Above: A bounty from the Farmer’s Market. Bring a large pot of salted water to boil. Cook pasta according to package directions. Drain, reserving a small amount of pasta water (about 1 cup), toss with olive oil, set aside and keep warm. Meanwhile, use a large skillet over high heat to brown sausage, crumbling with a wooden spoon. Add pepper strips and saute 3 minutes. Add beans and saute 3 minutes, adding olive oil if pan is too dry. Add tomatoes, seasoning with salt and pepper, and saute until softened, about 2-3 minutes. 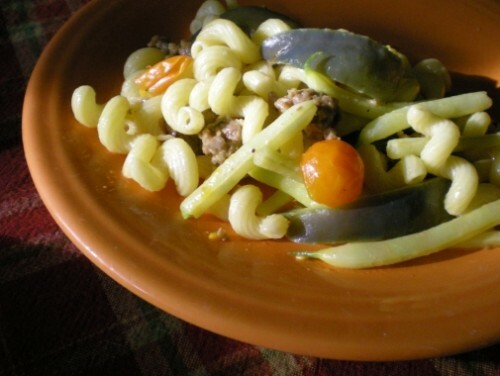 Combine pasta and vegetable mixture in a large pot or bowl. If using, add basil. Add reserved pasta water as needed, enough to keep mixture moist. Season with additional salt or pepper if needed. Serve immediately. Home made hummus, for me, has always been a challenge. Ingredients like tahini are expensive and the results are never as flavorful as the commercially prepared varieties. This recipe is one of my favorites because it is tahini-free, making the recipe simpler and less expensive, and the results are rich and flavorful. The basic hummus recipe makes “plain” hummus, then there are several variations for different flavor combinations. Combine all ingredients in a food processor or blender. Season with additional salt and pepper if needed. If mixture is too dry, add additional olive oil. 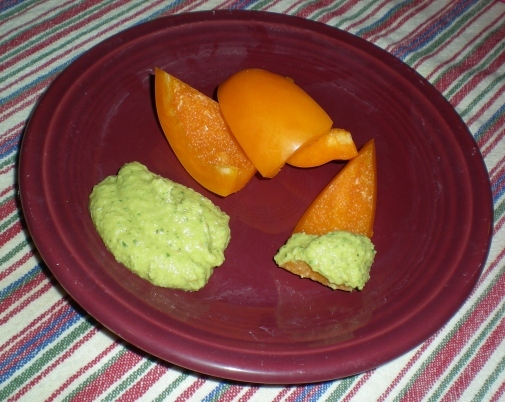 Spicy Cilantro-Lime Hummus: Substitute lime juice for lemon juice and add the zest of 1 lime. Increase cayenne pepper to 1/2 tsp and add 1/3 cup tightly packed cilantro leaves. Roasted Red Pepper Hummus: omit cumin and add 2 tbsp fresh oregano leaves. Add 2/3 cup chopped roasted red pepper. Garlic Lovers Hummus: increase garlic to 3-4 cloves (or as much as you like!). 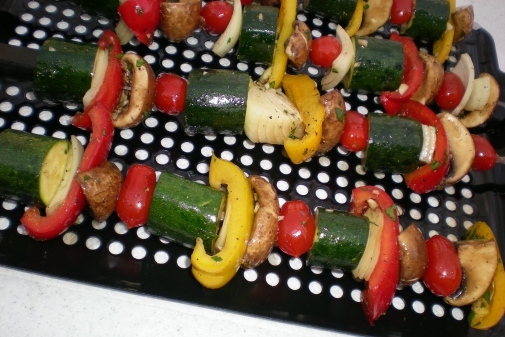 Here is another Veggie Tales recipe for the grill, this one using all kinds of summer vegetables. The marinade used here is flavorful without overpowering the vegetables. For this recipe, you will need to use skewers to cook the veggies on the grill. If using wooden skewers, soak the skewers in water beforehand to avoid burning, preferably 3-4 hours or longer (2 hours being the bare minimum, but be prepared to deal with the possibility of skewers catching on fire). There are two ways to assemble the vegetables on skewers. One way is to group like vegetables on skewers (one skewer for zucchini, another for peppers, etc) so that you can adjust each vegetable’s cooking time, then disassemble the skewers for serving. The other option is to arrange skewers so that vegetables alternate on each skewer (one skewer will have a zucchini, then pepper, then onion, etc) so they can be cooked all at once and served on the skewer. I favor the second option, because while cooking times to vary between zucchini and cherry tomatoes, the difference is not usually noticeable. If you cut the vegetables so they are all about the same size, they should all cook relatively evenly. Most summer vegetables have about the same cooking time, and this allows for easier serving and the skewers make for a nice presentation. Prepare marinade by whisking together all ingredients except vegetables in a small bowl. In a large bowl, combine prepared vegetables and marinade, using hands or two large spoons to toss and coat vegetables. Refrigerate for 30 minutes up to 2 hours. 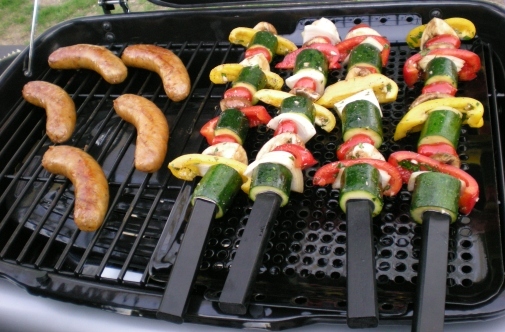 Place vegetables on skewers, then grill over high heat. Cook 3-5 minutes per side, until vegetables are tender. Serve immediately. Saffron is ridiculously expensive (in the United States) but I was fortunately enough to receive a boatload of it from a friend, allowing me to be generous in my saffron usage. If you are not as lucky, try a combination of turmeric and smoked paprika. For me, this combination best embodies both the color and flavor of saffron. My shortcut in this recipe is using instant couscous and allowing the saffron to steep with the couscous. Toss in some sauteed vegetables, and you have a wonderfully scented and colorful side dish. Bring 1 cup of water to a boil. Remove from heat. Add couscous and saffron. Stir and set aside for 5 minutes, then fluff with a fork. Meanwhile, heat oil in a large skillet. Add red onion to skillet and saute 3 minutes. Add zucchini and pepper to skillet, seasoning with salt and pepper. Saute until near tender, about 5 more minutes. 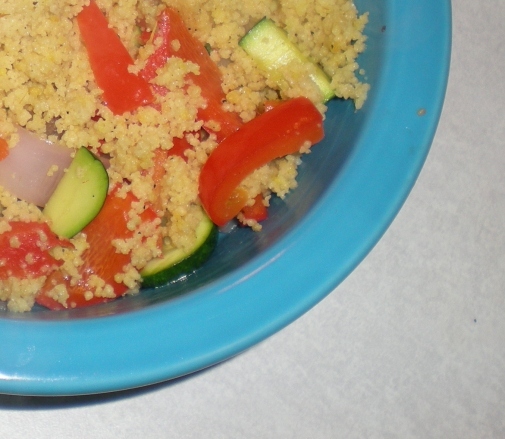 Toss couscous and vegetables together. Add a small amount of oil if mixture is too sticky. Top with freshly chopped parsley, if desired. Some images and content on Jenn's Cook Book may be licensed under Create Commons licenses. For more information, visit Creative Commons' Licenses.